D & L Carinalli Vineyards officially began in 1996 with a dream to grow grapes for wine and eventually have our own labels. Below is the timeline of how our dream is coming true! To see what we have planned for the future, see our Newsletter. In 1996, we planted our first grape vines, a modest two acres of Chardonnay to see if our soils and climate would support a vineyard. As the plants seemed to do well on our property, we planted another 18 acres of Chardonnay in 1997 and 3 acres of Chardonnay in 1998. In 1999, we decided to try another variety of grapes, Pinot Noir. Our timing was perfect with the love of Pinot Noir wine happening. In 2000, we planted another 12 acres of Pinot Noir. As our vineyards and winery sales started to grow we planted another 12 acres of Pinot Noir in 2005, 13 acres of Pinot Noir and 2 acres of Chardonnay in 2006, and finally, in 2007, we planted 12 acres of Chardonnay and 9 acres of Pinot Grigio. 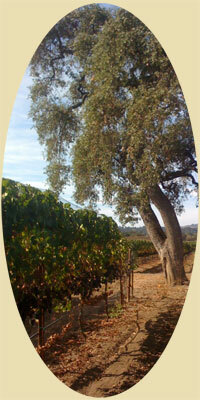 We now have planted approximately 100 acres of grapes on our ranch. Our Chardonnay and Pinot Noir wines have won many awards over the years. See our awards page for details. 1996 Ventured into grape world by planting 2 acres of Chardonnay grapes. 1997 Chardonnay grapes did well. Decided to plant more. 1998 Decided to plant a small block of Chardonnay. 1999 Chardonnay grapes did great. Decided to try new variety of grapes - Pinot Noir. First year of Chardonnay harvest was small - without netting the birds ate most of them! 2000 Pinot Noir did great. Planted a new block of Pinot Noir. 2004 D & L Carinalli Vineyards is established. Created our first label and bottled our first wines, our 2003 Chardonnay and 2003 Pinot Noir wines, Sonoma Coast. 2005 Created our second label for 2004 Chardonnay and 2004 Pinot Noir wines, Sonoma Coast. Planted another block of Pinot Noir and a small amount of Chardonnay. 2006 Created our third label for 2005 Chardonnay and 2005 Pinot Noir wines, Russian River Valley. Planted yet another block of Pinot Noir. 2007 Created our fourth label for 2006 Chardonnay and 2006 Pinot Noir Russian River Valley Estate Wines. Planted another block of Chardonnay. Decided to try another variety of grapes, Pinot Grigio. 2008 Created our fifth label for 2007 Chardonnay and 2007 Pinot Noir Russian River Valley Estate Wines. Decided to make Vin Rosé wine. 2009 Created our sixth label for 2008 Chardonnay Russian River Valley Estate Wine. Bottled our first 2008 CA Vin Rosé wine - "Diane's Delight". Picked our first harvest of Pinot Grigio Russian River Valley Estate grapes. 2010 Created and bottled our sixth label for 2008 Pinot Noir Russian River Valley Estate Wine, our second 2009 CA Vin Rosé wine and our first 2009 Pinot Grigio Russian River Valley Estate wine in January. First year of sale - 2009 Pinot Grigio Russian River Valley Estate wine. Sold 2010 Pinot Grigio grapes this year - no 2010 vintage bottled under our label this year. Created and bottled our seventh label for 2009 Chardonnay Russian River Valley Estate Wine in July. In December, created and bottled third label for 2010 CA Vin Rosé. 2011 Created and bottled our seventh label for our 2009 Pinot Noir Russian River Valley Estate Wine in February.